Magnolia Plantation Bed and Breakfast | Tales of deals, steals, and humor from the Plantation. Moving a child into college is one of those tough times that no one tells you about. A few people will tell you about the string of emotions that come with it and you can bawl your eyes out witnessing it in Toy Story 3. But there’s so much more to it than that moment you have to hug them and drive off. There are the unsuspecting logistics that need to be attended to. When is the actual move in date? When should we head to town? How long will it take to move in? Will they need help finding other things such as the closest bank, grocery store, gym etc? And if so, who can point us towards the best ones? It’s a crazy time when you’re releasing your baby into the world. The last thing on your mind should be worrying about where to stay while it’s all happening, because trust me, based off experience, you can not all pile into their already small dorm room amongst boxes and move in furniture. That’s why we’re here to help. 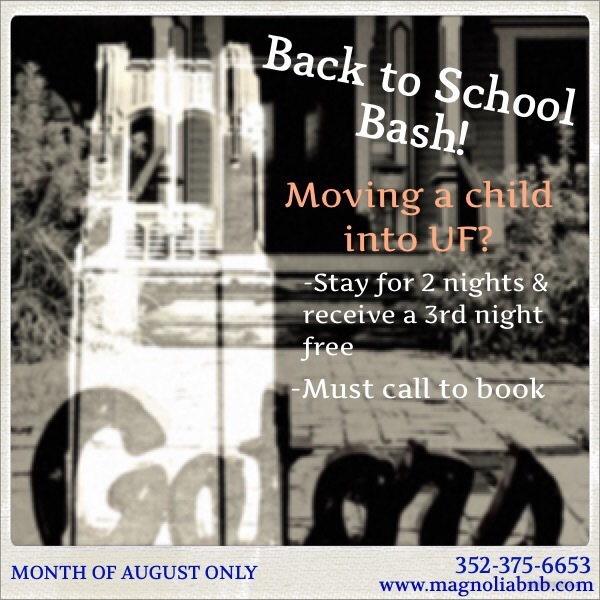 For the month of August the Magnolia Plantation Bed and Breakfast will be offering a move in special. If you’re coming to Gainesville to move someone in to college, then you can receive a free night! Just stay 2 nights at regular price and then the 3rd night is on is. You’ll need those first 2 nights to work. That 3rd night can be your time to relax and take in everything that’s happened. Your Bed & Breakfast stay includes a full, hot breakfast every morning along with wine & snacks in the evening and daily service. As a bonus, you’ll be staying with proprietors that have helped stich the fabric of Gainesville the past 26 years and therefore know how to introduce it to you and your child, a new Gainesville resident themselves. They can give you all the best secrets. Most importantly, you’ll leave comforted knowing that even if you’re miles away, your child has a couple in town that are there if they need them. 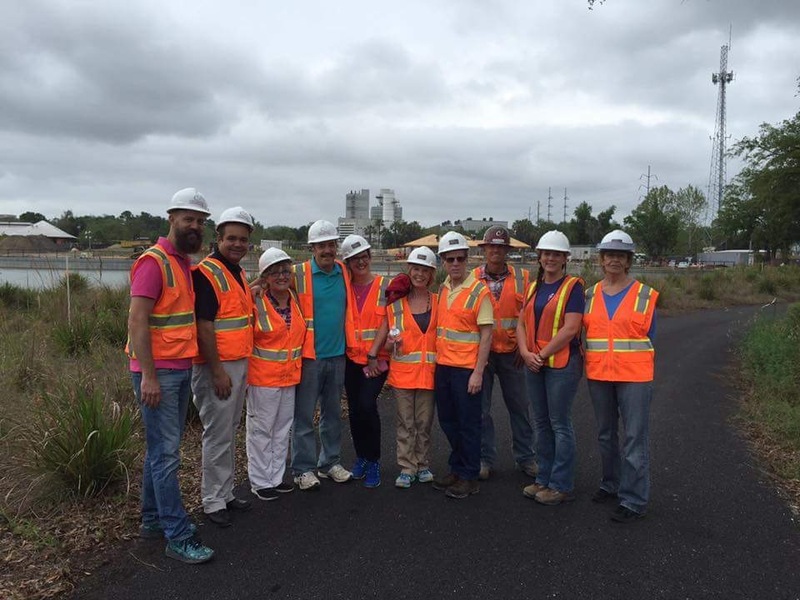 Joe & Cindy along with Gainesville residents, tour the Depot Park project, a downtown revival they’ve been a huge part of. If you would like to book your 3 night stay-2 nights plus 1 night free-in any of our rooms or cottages for the month of August, call today! This offer must be booked over the phone but feel free to peruse the website first to get an idea of which accommodation of where you’d like to be. This stay will also come in handy down the road as we give first priority on graduation weekends to guest that have stayed with us before. Call today and we look forward to seeing you soon! Palm Sunday, 2015—Joe and I took a drive to Vero Beach to visit Joe’s Mom and Dad. We were sitting in a restaurant having lunch, and Joe started to tell of our recent discovery in a way to drop my usually high blood pressure. Our neighbors, Rick and Jean, had acquired a Pontoon boat and had been trying to get us out on the boat for a while. Unfortunately our schedule had kept us from joining them. Then one night, everything fell into place and we took off across Lake Santa Fe. Joe told his parents how he immediately saw me relax as soon as we hit the water. Dad looked at Mom and Mom looked at Dad and before we knew what happened, we owned Dads 1975 17-foot Glasspar Runabout Bow Rider. Joe was overjoyed. I think some of my iced tea flew out of my nose. We made arrangements to come to Vero Beach a few weeks later to tow the boat to its new home in Gainesville. Joe located a boat mechanic and made arrangements for him to come over to inspect the boat. Since Mom and Dad had not had the boat in water since 1989 and it was covered in a barn for all those years , we thought that would mean surely it would be just a few touch ups and tune ups to get us in the water. Well the boat mechanic came and Joe was like Tigger, bouncing all over the place with excitement. AND THEN the verdict was pronounced…while the motor could be operational for about $300 the rest of the boat was a different story. As the mechanic told us “the engine is pretty much fine but the first time you put it in the water and hit the throttle, the back of the boat would break off and the boat would sink”. Tigger turned into Eyore. The mechanic took one look at Joe’s face and started making calls to see how much it would cost to repair. After 3 calls telling him to take it to the dump, the mechanic told Joe he would take it on and work on it in his spare time. Joe & Ed with the boat’s newest motor. After Joe heard what the experts had to say, he called his Dad. His Dad called him back about an hour later and said he had been on YouTube and wanted to come to Gainesville to start the repairs. While very sweet, it was not a good idea. There’s only so much you can learn on YouTube. Since then, Joe has taken every opportunity to tell guests about his parents’ “gift”. Two of our favorite guests, Ed and Nancy, who live in Chapel Hill, NC, heard about the boat on one of their visits. The next time they came down to Gainesville, Ed gave Joe his 1982 British Seagull 2 HP motor that he had restored. I guess Ed wanted to make sure that once we get into the water, that we actually make it back to shore. *As of this writing, the boat is still not rebuilt but it’s ok because it’s so hot we are heading to Georgia in July. So after 2 weeks of sleeping on an AERO bed, Joe decided we needed to start looking for a house that we could operate a ligament Bed and Breakfast out of. At this point we still naïvely assumed we would continue working our jobs and somehow work the guests into the mix. I was a real estate paralegal and Joe was working for an engineering company. There was a historic house that had been for sale for at least 3 years and it was still in our downtown historic neighborhood. We made an appointment with a realtor to see the property. At that time Orlando had restrictions on how many square feet you could operate as a business in your home. We figured we would be able to get 3 guest rooms with what the codes allowed but felt sure that at some point the restrictions would relax and we could add at least 2 more rooms. We made an offer and waited by the phone as the realtor presented our contract. She called us at 6:30PM and told us that 30 minutes earlier someone else had made an offer and it was accepted. Now remember this house had been on the market for 3 years. This happened to us at least 4 other times on our search. We would make an offer and for one reason or another someone always beat us to the finish line. It became laughable. We found a house in Claremont and it really was perfect. It was completely original with a large piece of land surrounding the house, basically a blank slate. As we were walking through the house I was envisioning beautiful weddings with the bride coming down the grand staircase and the house lit with candles and soft music playing. Then we walked into the kitchen/dining area and something happened. Joe and I looked at each other and could not get out of the house fast enough. The kitchen was outdated but other than that, there was nothing that should have made us skedaddle. When we got outside, the realtor asked us what was wrong and we both had no explanation. Side Note: In October 1991, 3 months after we had finished restoring the Magnolia Plantation and probably 2 years after we had our unexplained experience at the Claremont house, we were watching a TV show on haunted houses and Joe paused the TV long enough for me to really look at the house they were talking about. It was the house we had looked at in Claremont. It seems John Harden was living in the house with his second wife and their newborn. He woke up and smelled smoke. He went through the kitchen and saw his truck on fire. Someone shot and killed him and his murder has never been solved. Check out the ghost story for yourself here. But back to the story of our search; it continued and one Sunday we found ourselves at Leonardo’s 706 in Gainesville. We picked up a paper and found a Victorian for sale in the Duck Pond neighborhood. After calling the phone number listed and leaving a message, we took a drive by the house and immediately fell in love. The owner called us back the next day and that next weekend we took another drive up to Gainesville. Gainesville has always been important to us. Joe was just starting his senior year at The University of Florida when I moved from Cleveland to be with him. We got married in Gainesville and started our lives together so we knew the student area of town but had no idea Gainesville had so much history. We got to the house and met with the owner. While the house still had much of its original woodwork, it had been cut up into mini apartments. I kind of liked the idea of leaving it alone so every guest would have a suite. The B&B that almost was. River Phoenix’s girlfriend had other ideas. We met a young lady who was living at the house and she was very curious about what we were planning on doing if we bought the house. Later that night we called the owner and told him we wanted to make an offer. We were planning on offering him his asking price and the only contingency would be us selling our house in Orlando. That’s how bad we wanted this house. I worked up the contract and sent the owner his copy for his signature. Nothing…a week went by and still…nothing. Finally Joe called the owner and he apologized for not getting back to us but he decided not to accept our offer. Seems the young lady who asked us so many questions was the girlfriend of River Phoenix, the actor, and she did not want to move so he offered to buy the house from the owner. River never bought the house but the young lady got to finish out her education living in the house that she loved. Despite suffering another loss, we had decided by then that we really wanted to be in Gainesville so Joe called the City of Gainesville, and told them of our dream. He got transferred to the Economic Development officer, Thad, who told him of a historic house that had been for sale for a few years but was no longer on the market. He told us he would do some checking to see if it could be bought or if there were any other houses that would fit our needs. Joe got a call the next day from Thad telling us the house could be bought and a realtor would be happy to show it to us on the following Sunday, which just happened to be Easter Sunday. Every story has a beginning. This is ours. After 25 years of running the Magnolia Plantation Bed and Breakfast, we have quite the repertoire of interesting stories. Some exaggerated; some that we wish were exaggerated but are unfortunately true; guest that made us laugh; guest that made us cry; guest that made us want to run down the street; the daily roller coaster ride that comes with maintaining a house over a century old—we could have our own sitcom for sure. With new arrivals, we often will find ourselves sharing some of these tales. This inevitably leads to the question that we ourselves are still asking—why open a B&B in the first place? We usually answer with “insanity runs in both our families”, which is true, but, as Walter Cronkrite would say, here’s the rest of the story…. In the early 1980’s Joe and I took our first non-camping vacation. I had done some research on Bed and Breakfast and while there were not near as many as there are now, it was an up and coming trend. We were taking a road trip to Maine and I found a B&B in Bar Harbor, Maine that looked interesting. I booked the Inn for 3 days and as Joe was packing the car to check out on the last day, he found me sitting in one of the Adirondack Chairs in the yard contemplating life. He recognized the look on my face and was justifiably concerned. He sat down in the chair next to mine and asked “The question”…What are you thinking about sweetheart. And so the dream began. “Joe”, I said, “I can do this. I can run an Inn, I want to run an Inn, and I need to run an Inn.” Poor guy, I bet he wished he had just waited in the car for me. We had just bought a historic house in Orlando. It was a small 2 bedroom, 1.5 baths but it had great potential. We contacted an architect and designed an addition. Our master space was at one end of the house and the other two bedrooms were at the other end. After the renovation was completed I signed us up with a reservation service. Much like the current Vacation Rental by Owner sites, people would call a service and she would call her list of people to see who could accommodate guests. The agency took almost 60% of what I made but I was experimenting to see how we would feel with people in our home. Our first guest was AJ. He lived in New England and traveled around the country building playgrounds from used tires. Since he traveled so much and stayed for over 3 months, he was looking for something homier. He wanted to prepare his own meals since he didn’t know what his schedule was going to be. Joe and I both worked within walking distance from where we lived and would come home most nights to find AJ sitting on the couch watching the news with a cat stretched out on the couch behind his neck and the dog laying at his feet. AJ is the one who introduced us to Ben and Jerry’s ice cream. B&J is what got us through the restoration of The Magnolia Plantation. One day Joe came home from work and found our suitcases at the front door. I had booked us out of our bedroom for 2 weeks. We had some friends who had just moved and were waiting to close on their house. It was currently empty and without furniture. We slept on an air mattress for 2 weeks. Joe, being the patient guy he is, decided that I must be serious about this B&B thing. Thus began our search for the perfect Inn to call our own. Love it or hate it, the calendar still says it’s coming. Here at the Magnolia Plantation Bed and Breakfast, we choose to embrace it…mostly because we have a property full of romantic settings. We hope that as you make your Valentines Day plans, that you choose to spend it here at the Plantation where we have everything you need to make it a perfect weekend. From the setting to the gifts to the small touches that make a big impact, you can find the full package at the Magnolia Plantation. In the Main House, we have numerous Victorian inspired rooms. They’ll sweep you and your special someone away with fireplaces, claw foot tubs and an attention detail that bespeaks of a time when romance wasn’t interrupted by cellphones. Our cottages are private and cozy, providing a secret getaway where only the two of you exist. And with each cottage having a kitchen, porch/courtyard and sitting area, these cottages are ideal for those who want to stretch their Valentine celebration as long as possible—maybe even an entire weekend! This Valentines Day, we want to show you that we love you just as much as you love your special someone, so come spend the weekend with us and allows us to play a little Cupid. The best way to guarantee every bit of the weekend is special, is to spend it at the Magnolia Plantation! With your reservation, you will be choosing a gift of your choosing that will be waiting for you at check in. Since Valentines Day is on a Sunday, this offer will last for stays on the night of the 12th, 13th or 14th. Please review the following. A bottle of wine and flowers. *The Magnolia Plantation loves to tinker with chocolate candies in the kitchen. You can choose a chocolate special from below. Cracker Candy, wine, flowers and fire set the scene for a perfect Valentines Day at the Magnolia Plantation. If booking a reservation online, please put your preference in the special preferences and notes. If booking a reservation over the phone, simply give your preference to the innkeeper. As we draw closer to this lovely weekend, come back to our blog here for more ideas on how to make Valentines Day special. So don’t stress over your Valentines Day plans. We already have everything ready for you here. The best way to guarantee every bit of the weekend is special, is to spend it at the Magnolia Plantation! Book online at www.magnoliabnb.com or call 352-375-6653. Hurry, as rooms are booking fast for the weekend! There are a few truths around the Magnolia Plantation that never change. There’s no such thing as too much wine. Breakfast should always be served with a side of a good story. And the Florida Gators will always be close to our hearts. It’s near impossible to be in Gainesville and not feel the blessed Gator presence woven into everything this town is about. During football season, the heartbeat of the city beats to the time of the game clock. But there’s a secret that only few realize and one we want to help others discover; Gainesville is even more charming during the spring. Flowers are in their full glory, art shows pop up all over the place and you better see the eclectic nature of this Central Florida gem. The best part though? There are still TONS of Gators sports to immerse yourself in. Book online and then show us your ticket to the sporting event when paying for your stay and you will receive a 10% discount! Keep reading for details! Basketball, baseball, softball, gymnastics, tennis, the list goes on and one. The Gators softball team is coming off back-to-back National Championships and with their sights set on a third. The Gators gymnastics team? Yea they’ve already gotten their third straight championship and are about to start their search for the quadruple whammy. The Gators baseball team was just recently named the preseason No. 1 team in the country and by visiting Gainesville, you can watch them start their journey at home on the road to Omaha. Yes, there are so many options for Gainesville in the spring, and we hope you get to experience many of them. As a way of enticing you to our beloved city and just blatant homerism, we’re offing a “Go Gators Special” for the duration of winter and spring. Attend any Gator sporting event during the week* (Sunday night through Thursday night) and save by staying at the Magnolia Plantation! Book online and then show us your ticket to the sporting event when paying for your stay and you will receive a 10% discount! *This does not apply to stays on Friday or Saturday night. If you stay on a Friday or Saturday night and attend a sporting event, show us the ticket and we will make sure to apply the 10% discount to any future weekday stay. We love our Gators and we love our guest, so let’s combine the two! And seriously, who doesn’t want to come see this? The New Year is upon us which means the holidays have just ended; before we can truly get 2016 started though, we need to take the necessary break from the holidays. All that merriment and in-laws can be tiring. Not properly recovering is what causes us to lose steam and break all of our New Year’s Resolutions. I’m pretty sure that’s scientific. So slip away unnoticed for a quick breather. Our popular Vacation Rental deal is going on through Martin Luther King weekend. The Ginger cottage is a small efficiency that’s big on charm. Vacation Rentals mean 2 people can stay in any of our cottages for $115 a night. This is a 3 night minimum with no breakfast and minimal service. If you have extra guest coming at any time or for the entire stay, then an extra bedroom can be rented for $25 a night. All of our cottages have some sort of kitchen (either a full kitchen or kitchenette) and are private. They range from one bedroom to three with several cottages hosting gas fireplaces as well. All hold televisions and DVD players, along with complimentary wi-fi. Even if you don’t get to visit us before January 19th, vacation rentals can be negotiated at other times throughout the year. We understand, sometimes you just need to put on pajamas and spend 3 days falling in love with Mr. Darcy again and unlimited control of the remote. Mr. Darcy would approve of our charming cottages for your vacation rental. 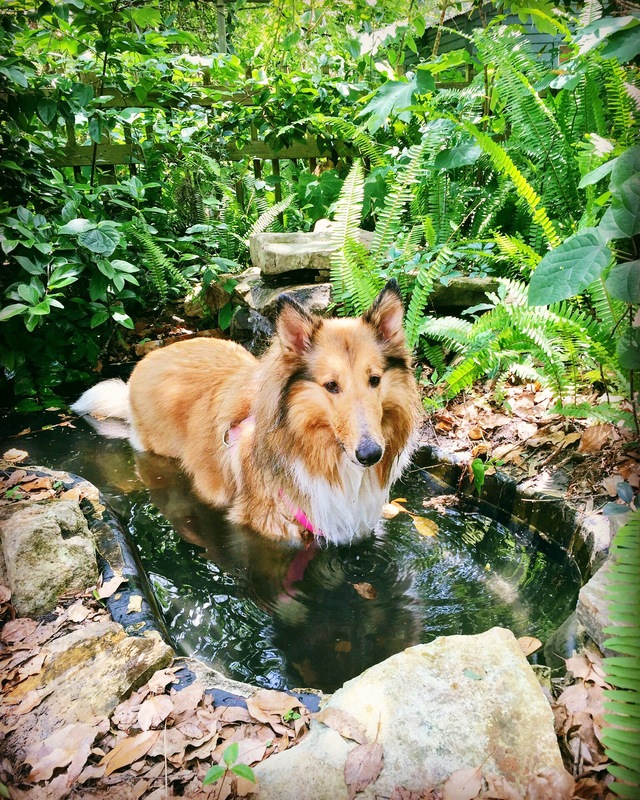 So come to the Magnolia Plantation and let us be your oasis, your home away from home and your place to recharge for the new year. It’s the perfect way to begin a new year for a new you. Give us a call at 352-375-6653 to make a reservation with our innkeeper; or visit www.magnoliabnb.com to browse pictures of the cottages and make your reservation online. The Magnolia Plantation at night is like a fairy tale. The Carriage House provides ample space for relaxation. The Carriage House stays true to it’s time period…but not the hay. The Carriage House provides a kitchenette and seating for two in the charming converted cottage. The Carriage House bathroom exudes luxury. Gardens and fountains make sure every turn at the Magnolia Plantation is relaxing. Miss Huey’s Cottage is truly a home away from home. Miss Huey’s Cottage living room invites you to sit and visit. The sunroom at Miss Huey’s Cottage remains bright & airy to cheer any mood. Jessica’s Courtyard takes you away to a magical place. The Nutmeg cottage invites all who visit to escape from the world. The Ginger cottage is a small efficancy that’s big on charm.